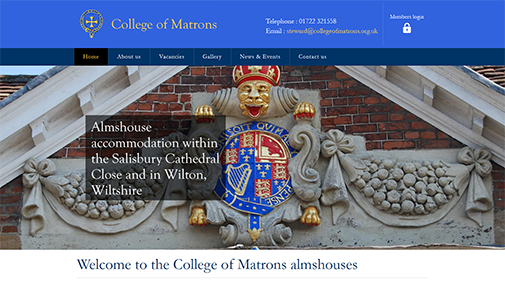 The College of Matrons approached Cosmic requiring a website for their charity. The website needed to showcase what they can offer, along with the ability to share vacancies, latest news articles, image galleries and events. Users can also login to a 'member only' area for extra access. The website is responsive, therefore is presented differently on mobile phones and tablets for better ease of use. The College is a registered Almshouse; it was originally founded by Seth Ward, Lord Bishop of Salisbury, in 1683. The principal object of the College is to provide accommodation for eligible women (Matrons) in the premises of the College in The Close in Salisbury and in St John's Priory in Wilton.